For ultra-luxe living in Lisbon, high-society Chiado is the place to be. A sophisticated district of theatres, book shops, old-style cafes, art nouveau jewellery shops, stylish bars, and high-end luxury brand stores, it is one of the most exclusive and prestigious areas in the world especially the heart of Chiado, Rua Garrett. The charming beauty of Chiado's old buildings and the extremely customer-oriented service of its businesses make it a very desirable address. The area was reborn in the wake of a ravaging fire 20 years ago, and remains one of Lisbon's most beloved neighbourhoods. Principe Real, the city's gay quarter, overlooks the city from the top of a hill. There are several gay and lesbian clubs here, as well as antique shops and galleries along Rua Dom Pedro V and Rua da Escola Politecnica. Beautiful 19th century townhouses line the Rua da St. Marcal. In the centre of the district is the tranquil and verdant Praca das Flores. The district of Estrela is marked by a huge domed basilica, near the Sao Bento Palace (which houses the Parliament) and connects to the well-heeled quarter of Lapa, where there are opulent old mansions, palaces, and embassies. Chiado is a choice locale not only for its serenity and beautiful surroundings, but also for its advantageous central location. Property prices are higher here than elsewhere in the city. 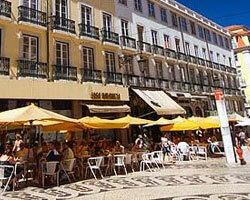 For many, though, the elegant, high-ceilinged buildings in Portugal's top shopping district may be well worth the price.